so as to make suitable for reuse. At the tracks, NASCAR recycles plastics, paper, cans, and has kiosks for recycling old phones. NASCAR also gives out envelopes so if you left your phone at home it can be sent in the prepaid envelope. NASCAR gives the old phones to Sprint (the phone provider) to recycle. Since 2001, Sprint has saved more than 24 million phones from sitting in a landfill. All these recycled phones add up to about 2,600 metric tons that have been recycled (Sprint). Coca-Cola and Miller Coors are both partners with NASCAR, and both partners help recycle and teach fans the benefits of recycling. Coca-Cola has added almost 10 thousand recycle bins at tracks were the product is sold. These bins have been distributed all around the track instead of just where the vendors are. 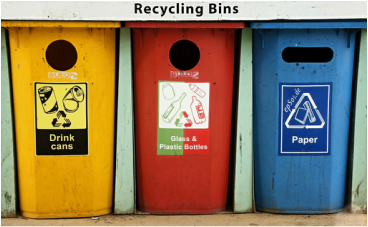 Recycle bins can now be found in the stands, suites, garages, and in the campgrounds that you can stay at for the weekend (lynch). Coca-Cola has also started other programs to spread awareness of how important recycling is and to get people out and start recycling themselves. NASCAR also recycles and reuses tires and oil you can read about it by clicking here.